If you're serious about becoming a better crossword solver, you just might want to heed the advice on this page. It comes from a man by the name of Tyler Hinman, who at just 25 years of age, is quite possibly the fastest crossword solver on the face of the planet! As legend has it, Tyler's interest in crosswords was triggered by a ninth-grade teacher who gave him a puzzle to solve while he was waiting in a hallway. The crossword came from a Tuesday edition of the New York Times. Now, if you're familiar with the New York Times crossword puzzles, you'll know that they increase the demand on the crossword solver throughout the week, with the easiest puzzles appearing on Mondays. So Tuesday's puzzles are considered to be pretty easy. Tyler made very little progress on that puzzle, but it got him hooked. His progress from that point on is astonishing. Tyler Hinman is a sixteen-year-old crossword constructor whose work has appeared in the New York Times and TalkTeens, a monthly publication aimed at teenagers. Just a few years later, Tyler won the most prestigious crossword-solving competition in America - the American Crossword Puzzle Tournament (ACPT). He was the youngest winner ever. Harder to believe, is that he went on to win that tournament another four consecutive times, making an unprecedented winning streak of five (unbroken at the time of this interview!). Hi Tyler. Thanks so much for agreeing to this somewhat extensive interview. I'd like to start by asking you to tell us a bit about the guy in the picture. I'm 25 years old as of this writing [December, 2009]. After spending my high school years in England due to my dad's job, I went to Rensselaer Polytechnic Institute in Troy, NY and got my degree in Information Technology in 2006. I spent about two years in Chicago as an unsuccessful bond futures trader and then as an unemployed lump. I was rescued in mid-2008, as I got an internal software development job with Google. I live in San Francisco and commute to Mountain View daily. 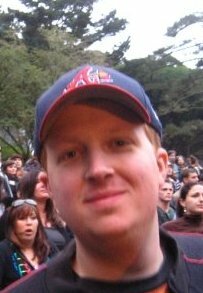 The Bay Area has been very good to me - there's a large contingent of puzzlers out here as well as friends from other areas of my life. My other interests include rabid sports fanhood and Swedish rock music. Pen in the newspaper, pencil for books and magazines and stuff I print from the computer. It's an aesthetics thing - I think the cachet of the pen is overblown. People are blown away by how much you know at such a young age. Did you start out with a very good knowledge of trivia from your childhood years, or did you acquire it through solving crossword puzzles? I had a lot of boring summers in my early adolescence, and I watched a lot of Game Show Network. I guess I picked up some stuff through there. A lot of the trivia that's relevant to puzzles, though, is stuff I learned from puzzles. Constructors these days like to be modern, so if they use old-timey trivia I'm not likely to know at first, it's probably the sort of answer that shows up in crosswords a lot, which means I'll learn it. What's your take on crosswordese? What are three of your most hated or cherished (depending on your take) crosswordese entries? If you mean true crosswordese, which is stuff that barely appears anywhere else in the world but crosswords, yeah, I hate it. Puzzle-making is a skill and an art - throwing in something like ESNE or ANOA strikes me as being akin to an Impressionist painter getting halfway through a work, getting stuck, saying "screw it", and going Pollock on the rest of the canvas. Sure, sometimes we all get desperate and use something like that, but that doesn't mean it ain't ugly. I can't pick the three worst offenders, but I did pick 32 in a piece I wrote for a book called The Enlightened Bracketologist. How often do you encounter a New York Times crossword puzzle that you can't solve completely without looking up references? It's decently rare, but not unheard of. I'll never leave a square blank - I'll always hazard a guess before seeking confirmation online. I never cheat if it's something I feel like I should know, but sometimes there are a couple of things I know I'll have no shot at. If you don't know it, you don't know it. 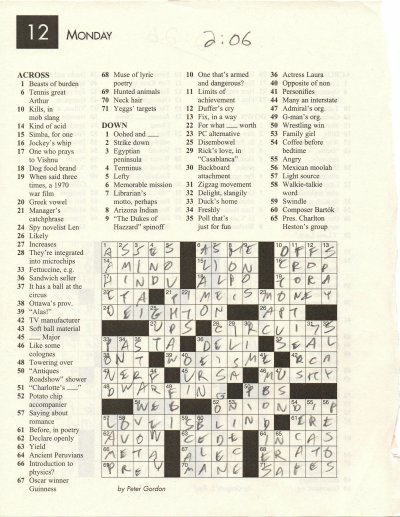 Which crossword puzzles, if any, do you do more or less religiously? I do Newsday, LA Times, and NY Times every day. Other non-daily offerings I always hit are Wall Street Journal, Boston Globe from Cox/Rathvon and Hook, Ben Tausig's Ink Well puzzle, Merl Reagle's Philly Inquirer crossword, Jonesin' from Matt Jones, Matt Gaffney's weekly contest, Chronicle of Higher Education, Peter Gordon's Fireball Crosswords (well, not yet; these are upcoming), and perhaps others I'm missing. As a member of the CrosSynergy syndicate and the Onion constructing teams, I test-solve everything that comes through there before it sees print. I also test-solve for Brendan Emmett Quigley's blog. Do you prefer to solve your crossword puzzles online or on paper? I solve all of these online unless I'm about to board a plane or something and I want them printed out. I'd hemorrhage money on ink and paper otherwise. Do you have a favorite crossword constructor? If so, who is it, and what is it about their style that you enjoy? Merl Reagle is a naturally funny guy with consistently good themes that don't sacrifice quality despite being voluminous. I love Frank Longo's wide-open grids. I look forward to the challenge that Byron Walden always provides. Brendan Quigley, Ben Tausig, and Matt Jones bring a youthful irreverence that I enjoy. I could go on. If you put a gun to my head and tell me to pick one, I'm going Patrick Berry. He can do it all - in addition to brilliant themes and great fill in his conventional puzzles, he makes terrific cryptics and creative twists on the crossword grid. Tell us a few of the best crossword clues you have encountered. It takes a very common phrase and twists it around in a way that makes perfect sense once the answer hits you. Clues like that make for great fare in the tougher late-week puzzles. Do you have a favorite crossword clue of your own creation? It exploits the dual meaning of not one, but two words. I was proud of that one. What references (offline and online dictionaries, etc.) do you use most frequently for crossword-solving? Crosswords are generally viewed as a solitary activity. For those who'd prefer to share their love of the grid with others, what are the main 'crossword communities' (clubs, forums, etc.) you'd recommend? American Crossword Puzzle Tournament (ACPT) includes informal games and social activities in addition to the competition, so that's a good time. Cruciverb is a great forum for experienced and aspiring crossword constructors alike. My favorite, though, has to be the National Puzzlers' League. Every month, we share clever puzzles (most of them in verse form) with each other pro bono in The Enigma. And one of the biggest highlights of my year is the summer convention, which bounces around the country - we'll be in Seattle in 2010 and Providence the next year. There's tons of socializing in addition to some informal competitions. It's a fantastic group of people I always look forward to seeing. Is it possible to 'play' crosswords with opponents online, mini-tournament style? On the NY Times puzzle site, you can solve on the applet and compare your time to others. I believe they also have functionality for collaboration, but I've never used it. I'm sure other sites log solving times, but those aren't a part of my routine. Which crossword-related websites and blogs do you visit most frequently? Cruciverb - Links to daily puzzles in addition to the forums. NY Times puzzles - 'Nuff said. Puzzability - Fun daily teasers. Jumble and Jumble Crossword - Less than thirty seconds out of my day if things are going well. Stan Newman's Newsday puzzle - My first crossword stop of the day; usually an easy puzzle. Will Johnston's Puzzle Pointers - Useful if I fall behind on crosswords. Nikoli - It's not crossword-related; sue me. I love this last site, Nikoli, from a Japanese puzzle company. They have language-neutral logic puzzles (sudoku and kakuro are the best known, but they have other great stuff too) in Flash format. It's about four puzzles a day (size and difficulty varies) for five bucks a month. They have great books too. Ah, the one that's sporadically updated and badly in need of a facelift. Yup, TylerHinman.com. I keep my blog there - I muse about puzzles, mostly, with occasional digressions into sports and other stuff that amuses me. I'm hoping to expand it soon - it's on my always-bursting list of stuff to do. In one of your more tense ACPT victories you were stumped on a clue for several minutes before finally nutting out the solution after a small jig, and taking home the trophy. What was the clue that you were stuck on, and what was the key to solving it? "They're tied at the top"
and I had COL_A_ERS. The crossings, in order, were "Items in stock" = BON_S and some Star Trek-related clue for _OOHAN. I had BONDS in there. I never really thought it was right, but nothing else made sense, and COLD looked good for the crossing entry. Even after I finished, I didn't really get the clue, which was referring to soup. I thought the answer was DOOHAN, but I just wasn't sure, and my hesitation was increased by the fact that I was tentative on a few other answers in that corner as well. I wish I'd just written it in to see how it looked - it probably would've jumped right out me. I was trying to think of words that started with COL - the thought of putting a hyphen after CO is an elusive one. The situation. I knew I was alone up there with the whole room staring at me - my mind, I hate to say, was as much on "why the hell can't I do this?" as it was on actually trying to do it. Honestly, I credit my victory to that stupid little jig. I really think it dissolved the tension and brought me clarity. If you watch the video, you'll notice that my epiphany came a very short time thereafter. Even though I won, I'm a little embarrassed by that episode. Despite all those bullet points, I can't fathom how the final breakthrough took me so long. The Wordplay movie must have been a blast, right? Did you suspect it would do so well? Of course not - it was a movie about crosswords. I figured I'd see it on TLC at 1 AM one night. It turned into something pretty amazing - I had a lot of fun, and I don't exaggerate when I say it changed the course of my life. You became a bit of a celebrity after Wordplay came out. Was that a good or a bad thing? Are you still recognized in the street? I never got recognized that much to begin with. My Facebook friend count ballooned nicely, though. Overall, it was a great thing - I made a few new friends because of it. Do you actually 'study' clue/word lists like a Scrabble player would, or do you learn all the answers through the process of solving puzzles? This is precisely why I'll never be a competitive Scrabble player. Poring over those word lists strikes me as a profoundly boring activity and I honestly can't figure out why anybody does it. I owe the bulk of my ability merely to solving puzzles and absorbing the most common entries and styles of cluing. You've won the ACPT an unheard-of five consecutive times. Are these victories your proudest achievements in life so far? I'd have to say yes. Almost nobody gets to win five consecutive national championships in anything, and I did it before I turned 25. I started out as a guy who just liked puzzles and couldn't even do the NY Times puzzle on Tuesday, and it's turned into this immeasurably rewarding, life-changing exploit. It's nice to have a "thing". Before the wins, of course, there must have been a beginner. When was your very first ACPT, and how did you do? I flew over from England, where my family lived at the time, and got a total of maybe three hours of sleep the whole weekend. I blame my performance on that only a little - I just wasn't very good yet. Am I correct in saying that in the last five ACPTs you haven't made a single mistake in any of the puzzles? What are the main types of errors people make in the heat of that competition, and what is it about your solving style that gives you that edge when it comes to avoiding them? Not checking a crossing to make sure it's sensible and fits the clue. Just plain not knowing something. There are probably a few other creative missteps too. And, if you were wondering - an error in the tournament is in my future. It happens. To everyone. If for some reason you were unable to compete at the 2010 ACPT, who would you put your money on? I imagine crosswords take up the best part of your leisure time, but are there any other word games and puzzles you enjoy? Scrabble, Cryptic Crosswords, Balderdash,... ? The puzzles in the Enigma are always worth a look. Our puzzles in verse involve filling in the blanks with words that fit the given type of wordplay. There are a few other types in there too, which I'll let the reader explore. Most of all, though, I love cryptic crosswords. They always pose a fresh challenge and don't suffer from the crosswordese that plagues American-style puzzles. In addition to the cluing style, sometimes a weird gimmick will twist things even further. There's so much room for creativity that each puzzle is a joy. Despite winning the ACPT 5 times you are not listed in the Guinness Book of Records as the fastest crossword puzzle solver. Why is that? I publish a regular crossword puzzle in my Word-Buff Stuff! newsletter. It's a short, easy puzzle (only 24 entries, with a maximum word-length of 7). To give my readers a feel for your speed, I'm wondering if you could time yourself doing the puzzle they'll receive in the next issue? Sorry folks. This one is for Word-Buff Stuff! subscribers only. If you're interested in pitting your wits against Tyler, you can subscribe here (yes, it's free) and check out the puzzle - you'll find it in Issue #2. But I will tell you that Tyler did hammer out the solution in under one minute! And that was despite a little struggling with the applet, and initially misreading a clue. Although you're most famous in the world of word games as a crossword puzzle solver, you are also an active crossword constructor. Can you tell us a bit about the crosswords you create? I sporadically publish puzzles in the New York Times - I've been published at least once on every day of the week. That's fallen off of late, although there are a few accepted puzzles still awaiting publication, though, and they should all be Saturdays. My most active gigs right now are The Onion and CrosSynergy. In the former, I'm part of a circle of eight constructors. We test-solve each other's work before Ben Tausig, the editor, makes the final call. CrosSynergy is similar, except there are a few more of us and the final version is up to the constructor. Also, my Onion puzzles are bound to be irreverent and/or make references to pop culture. We keep it pretty clean at CrosSynergy. Lastly, the Onion puzzles are medium difficulty while the CS puzzles are lighter fare. Do solving and constructing go hand in hand? Does being good at one help you significantly with the other, for example? Nope. I was first published in the Times in 2000, and you read how I did in the tournament in 2001. There might be a slight correlation, but overall they're different skills. Do you use software to help you construct puzzles? If so, what software do you find most useful? Oh yeah. I use Crossword Compiler, the gold standard. I make sure to guide the construction myself so the fill turns out clean. The theme, grid, and clues are all of my doing (I consider myself pretty good at grid design, actually). Do you see yourself becoming less interested in solving and more interested in constructing as time goes by? I see my interest in competitive solving waning. It's nice to be the best at something, and it's cool to blow through a few puzzles and get on with my day, but overall it's more fun to relax and casually work through a puzzle. In general, solving has held my interest better than constructing, mostly because I solve a lot more puzzle types than I make. A number of crossword enthusiasts have written some great narratives about life inside the grid. A few I have really enjoyed recently are Matt Gaffney's Gridlock , Stan Newman's Cruciverbalism , and Dean Olsher's odd-ball From Square One . Do you enjoy these types of books, and have you given any thought to turning your own unique 'crossword trek' into a book? Yeah, I've read most of those - they're interesting even though I'm kinda already on the inside. As for a book, that's yet another idea I've kicked around, but I dunno what angle I'd take. A bunch of takes have been done, and I can't convince myself that anyone would give a damn about my life story. Can you give Word-Buff visitors your top 5 tips on how to become a better crossword puzzle solver? Take a look at the puzzle every day, even if it's late in the week and you think it'll be too hard for you. It helps to get the exposure. You'll pick up on how constructors and editors think, and you'll naturally learn the answers that appear most often. If a clue's not budging, maybe you need to look at it differently. Could it be a verb when you've been thinking of it as a noun, perhaps? Be mindful of the different ways a short series of words can be read. Be prepared to erase wrong answers. If you have a wrong letter and you assume it's right, it can really throw you off. If you're having trouble in an area where you have a few answers, revisit them and ask yourself if you're sure about them. Keep staring at the damn thing. If you think the answer is gettable, odds are you're right. Sometimes your brain just suddenly breaks through with no warning. If you're still stuck, leave, do something non-intellectual, and come back. Thanks for such an incredibly thorough glimpse into the world behind the grid Tyler. This was truly helpful!